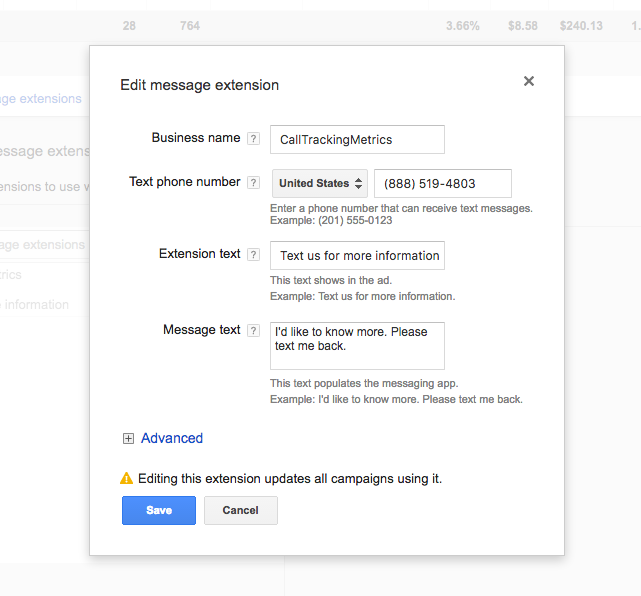 Google AdWords click-to-message ad extensions are out of beta, opening a new and exciting channel for advertisers to connect and engage with their prospects. While this new feature is a great tool for marketers, it lacks some important tracking and reporting features that CallTrackingMetrics provides to help agencies gain complete visibility into campaign performance. Texting is the most widely-used feature on a smartphone, with 97% of Americans using it at least once a day (Pew Internet). And, the average Millennial exchanges an average of 67 text messages per day (Business Insider). So it’s no wonder advertisers have had a strong focus on developing ways to incorporate texting into their marketing strategy. Much like most of Google AdWords ad extensions, the click-to-message extension are opt-in, designed to enhance your ad copy and improve campaign conversion rates. The click-to-message extensions offers mobile users an additional way to engage by sending them a customizable, pre-set text message. The extension allows advertisers to input a phone number that is text-capable with a 35 character call to action, and a 100 character pre-set message. As a user clicks the message icon, they will redirect to their mobile texting interface with a pre-populated message, packaged and ready to send. The user can easily customize the message as they wish. Security – Most businesses don’t have the ability to send and receive text messages through a third-party platform. While you can use any text-enabled cell phone, it displays the sender’s personal phone number, which can be a security concern. Reporting – Additionally, Google AdWords is only able to report on number of impressions, clicks, and conversions, with no data around number of messages received, bounce rate, timing, or sender profile data. These concerns may prevent many advertisers from exploring text message campaigns, but using a third-party platform, like CallTrackingMetrics, helps agencies fill in the gaps and gain complete visibility into campaign performance. CallTrackingMetrics offers local and toll-free text-enabled tracking numbers in 57 countries. These tracking numbers are perfect to use in conjunction with the new Google AdWords click-to-message extensions. Messaging platform – CallTrackingMetrics (CTM) provides an interface for businesses to log, respond, and report on text messages, phone calls and form submissions. You can even score text messages as conversions and attribute a sale amount. Automated response triggers – Users can create automated text message triggers to send a custom reply based on criteria like tracking numbers and keywords. This is a great tool to instantly engage with customers and prospects. Notifications – Schedule custom alert notifications via email and text anytime you receive a new message, along with the message and sender details. Caller Insights – Caller insights provides rich caller profile data, including name, contact and demographic information. This is a great tool for qualifying leads and enhancing customer experience. Attribution – CTM is able to match website visitors to calls and text messages, providing businesses with complete visibility into which advertising channels are performing. Auto Dialer – The Auto Dialer automatically connects agents with customers and prospects, maximizing productivity and conversions. Create a call back list for all AdWords click-to-message prospects, ensuring that every leads is automatically connected in a timely manner. Reporting – CTM provides a variety of reports to view the performance of your inbound/outbound campaigns, helping make informed decisions about which channels are driving conversions and revenue. To learn more about the power of CallTrackingMetrics with Google’s click-to-message extensions, request a demo or contact our team.